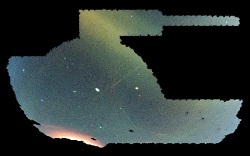 Data collection and processing infrastructure enables exploration of 400 million astronomical objects. 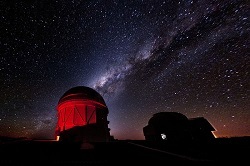 Dr. Felipe Menanteau, a Research Scientist at NCSA and Research Associate Professor of Astronomy, and the Dark Energy Survey team study the universe and use sky mapping exercises to try to understand where everything came from and if we are alone. Tandy Warnow and Michael Nute are researching what makes us different from other species and from one another by producing biological sequence analyses as it relates to genetic trees. They use the Illinois Campus Cluster Program (ICCP) to study the human microbiome and add what they find to existing genetic trees. Dr. Xiaohui Chen, Assistant Professor in Statistics, and his team are mining data to help neuroscientists find the mechanism that makes neurodegenerative diseases tick. 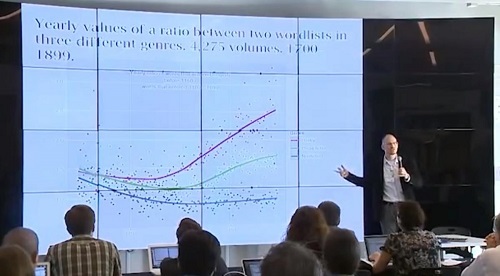 Dr. Ted Underwood uses high performance computing to look at patterns found in literary history over the course of several centuries and to find and see important words scattered across hundreds of stories in thousands of newspaper clippings, books, articles, plays, musicals, television shows, movies, and marginalia produced over hundreds of years. 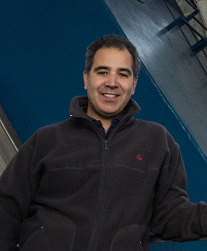 Dr. Eliu Huerta Escudero and his team are extending our understanding of gravitational wave astronomy by developing new tools that detect and characterize wave sources in dense stellar environments. Dr. Maria L. Chu, Assistant Professor in Agricultural and Biological Engineering, studies how a variety of factors alter how water moves in the watershed—affecting its quantity and quality.